A height adjustable shower chair with a comfortable one-piece seat that makes this option feels safe and secure. The height adjustment feature makes it adaptable to best meet the needs of short or tall users very easily. Like all good shower seats it has non-slip feet for added stability. The frame is plastic-coated steel for strength and corrosion resistance, and the seat has drainage holes too. 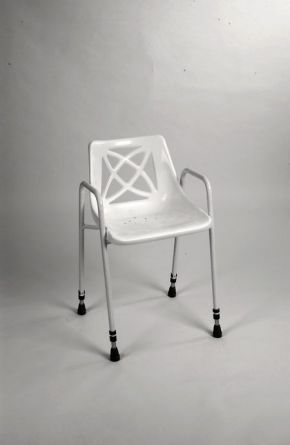 Armrests not only give this shower chair an added safety, they also assist in sitting and standing and can also provide some support when stepping into and out of the shower. very satisfied with this product it came quickly and was all ready to go just needed to adjust the height which was easy.